Just two weeks ago, Griffin Technology pulled the market this new "toy" for curious users and techies and the R / C: MOTO TC Monster Truck . 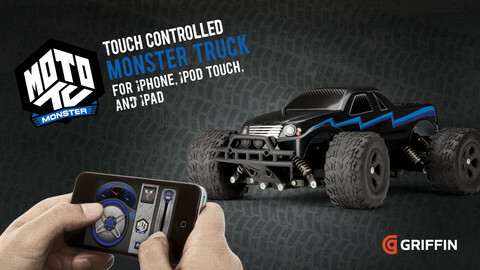 This is an SUV that is piloted through our iPhone, iPad and iPod Touch. TC MOTO Monster Truck is a classic 4 × 4 you can drive for any site via your iOS device, using a universal app and available in multiple languages. Touch: driving your SUV using the steering wheel and accelerator virtual onscreen. Motion: Tilt your device left or right to drive the vehicle. Slide: slide your finger across the screen to direct. Tracks: Let TC MOTO applying direct the SUV for you through a series of predefined paths and turns including eight track. Use this application to record your own tours to other driver, or even yourself, to challenge yourself and repeat your circuits. The vehicle is priced at around 46 € and application from the App Store for free. Directed undoubtedly the most fanatical engine wanting to try an alternative to the classic remote control.